1.1 The Fu Shan Crematorium at Shatin has been in operation for sixteen years, and complaints of dark smoke emissions from it have been received. The Electrical & Mechanical Services Department (EMSD) has assessed that the cremators are near the end of their service life, and it is technically infeasible to upgrade them to meet the latest environmental standards. The Food and Environmental Hygiene Department (FEHD), thus, propose to replace the existing cremators of the Crematorium (the Project). The Project was welcomed by local residents and supported by the Shatin District Council, when they were consulted in July 2000. 1.2 Crematorium is a Schedule 2 Designated Project, under the Environmental Impact Assessment Ordinance (EIAO), and an Environmental Permit is required prior to its construction. An application (No ESB-071/2001) with a Project Profile (No PP-123/2001) for an Environmental Impact Assessment (EIA) Study Brief was lodged to the Environmental Protection Department (EPD) in April 2001, and the EIA Study Brief for Replacement of Cremators at Fu Shan Crematorium, Shatin (EIA Study Brief No ESB-071/2001) was issued in May 2001. The Study Brief requires an EIA Study for the Project to assess the environmental impacts of the Project and to propose mitigation measures, where necessary. 1.3 The Architectural Services Department (ArchSD) is responsible for the design and construction of the Project. After the construction work is completed, the crematorium will be handed over to FEHD for its operation. Maunsell Environmental Management Consultant Ltd. (MEMCL) was commissioned by ArchSD to assess the environmental impacts associated with the construction and operation of the Project. The assessment results, respective mitigation measures and environmental monitoring and audit (EM&A) requirements have been documented in an EIA Report. (a) Construction of a new cremation room with four flat-bed type single cremators designed to meet the latest EPD’s Standard. (b) Construction of a pulverising room with a bone cremulator for pulverisation of cremated remains. (c) Installation of an automatic transport system for delivering the coffin from the service halls into the cremators. (d) Construction of a public toilet as a replacement for the existing one. (e) Provision of emergency generator room, main switch room, fire services pump room, sprinkler tank and storeroom, etc. necessary for the operation of the new cremators. (f) Re-alignment of the existing vehicle access. (g) Re-provision of car parking spaces and upgrading of the overall landscape area. (h) Renovation of the two existing service halls to cater for the change in the location of the new cremation room. (i) Demolition and removal of the existing cremators after the satisfactory commissioning of the new ones. Renovate the old cremation room into workshop for EMSD maintenance staff and storerooms. (j) Installation of fire services provisions, including sprinkler system, hose reels, street hydrant etc. to the existing crematorium to meet current fire safety standards. 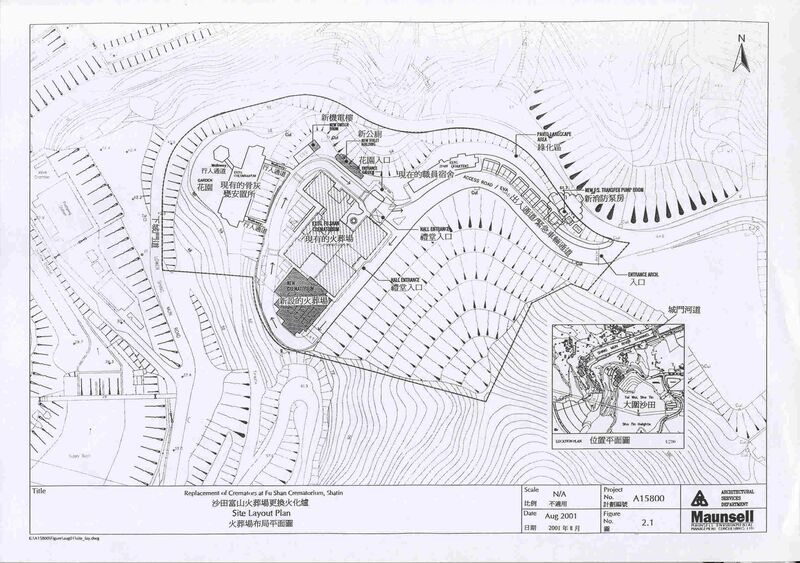 2.2 The project site lies within the site boundaries of the existing Fu Shan Crematorium, which is located in Area 18 of Shatin off Lower Shing Mun Road. Figure 2.1 gives the site location plan. The Fu Shan Crematorium site covers approximately 24,000 m2 and is currently occupied by the existing crematorium, columbarium and staff quarters. 2.3 The new cremation room will be built as an extension to the southwestern side of the existing crematorium, which is currently occupied by a public toilet, car park and garden. A chimney of 19 metres high (above the existing ground) will merge at the base of the new crematorium hallwith its lower part at the farthest end of the new cremation room. New emergency generator room and main switch room, providing upgrade of power supply for the replacement cremators, are located to the north-east of the existing crematorium and next to the existing transformer room respectively. The proposed site layout plan is shown in Figure 2.12. 2.4 Four new flat-bed type single cremators will replace the existing two twin cremators. To cater for the varying sizes and weights of coffin to be handled, three cremators of design capacity 170kg and one cremator of 250kg maximum design capacity will be provided. 2.5 The cremators are designed to ensure complete combustion and are fitted with a secondary combustion zone at high temperature satisfying the latest EPD’s requirements and emission concentration limits stipulated in BPM 12/2 – A Guidance Note on the Best Practicable Means for Incinerators (Crematoria). Adequate secondary air is allowed in the primary combustion zone to ensure good turbulence and combustion. The gases are held at 850oC for minimum of 2 seconds in the secondary combustion zone. A flue gas filtering plant will be installed to bring down the pollutant emission prior to its discharge. Dioxin emission is controlled by rapid quenching of the flue gas and activated carbon along the filtering system. A fabric filtering system is installed downstream to further remove particulate and dark smoke of the flue gas. 2.6 The flue gas after treatment will be ducted to a chimney of 19 metres above the existing ground. The chimney is higher than the physical structure of the new crematorium building and the adjacent existing Fu Shan Crematorium by more than 3 meters, to ensure good dispersion of pollutants. · Stage I: Construction of a new cremator plant room, new generator room and ancillary facilities, installation of four new single cremators, renovation of the existing service halls in the crematorium. A specified process licence will be obtained for the operation of the new cremators. · Stage II: Demolition of the two existing twin cremators after the satisfactory commissioning of the new cremators and renovation of the old cremator rooms. 2.8 The program of the Project will last from August 2002 to June 2004, taking 17 months for Stage I to construct the new cremators and 3 months for Stage II to demolish the old cremators. Table 2.1 shows the Project construction programme. 2.9 During the commissioning test period, there would be no more than 4 cremators in operation accounting for old and new cremators. The old cremators would ceased operation and be demolished and removed, upon satisfactory commissioning of the new cremators. Tthe new cremator is anticipated to be operational in April March 2004. 3.1 The Project Profile has identified that air quality impact, land contamination impact & waste management, landscape and visual impact, hazard to life and water quality are the key issues of the Project. Assessment guidelines and criteria stipulated in the Technical Memorandum on Environmental Impact Assessment Process (EIAO-TM) have been adopted for the EIA Study. Potential environmental impacts of the key issues associated with the construction and operation of the Project have been assessed, and the findings are summarized below. 3.2 A total of ten Air Sensitive Receivers (ASRs) have been identified for this assessment, namely Villages in Lower Shing Mun Road, Staff quarters of the crematorium, Lakeview Garden, Po Leung Kuk Y.C. Cheng Centre, Fu Shan Public Mortuary, Village at Heung Fan Liu, Granville Garden, and the proposed developments in Area 38A and Area 4C, Shatin. 3.3 Dust will be emitted during the to be the major air quality pollutant during theconstruction phase of the Project. As the scale of construction works is small, the dust generated from the Project is expected to be low. With the incorporation of mitigation measures stipulated in the Air Pollution Control (Construction Dust) Regulation, the dust criteria will be satisfied at all the ASRs. 3.4 Asbestos containing materials may be removed for the Project, however, the impact due to asbestos fibre is considered minimal. Precautionary and mitigation measures have been recommended for the Project to control asbestos fibre release during removal work. All asbestos containing materials should be removed prior to the general demolition works. 3.5 Air pollutants including particulate matter, hydrogen chloride, carbon monoxide, organic compounds, mercury and dioxins would be emitted via the chimney of the crematorium. Air quality impacts of these pollutants have been predicted with air dispersion model. Modelling results indicated that air quality criteria would be satisfied at all ASRs, under worst case scenario. 3.6 Cremation of human remains is the likely source of odour nuisance. In the combustion chambers, odorous gas will be broken down into simple compounds under high temperature and sufficient residence time. Also, the odorous gas escaped from the combustion chamber will be removed by the flue gas filtering system. Odour emission from the cremators is not expected. 3.7 It has been predicted that the increased risk level associated with the operation of the new cremators is insignificant at all ASRs, under worst case scenario. The health risk associated with the operation of the facility satisfied the international standard. 3.8 Waste to be generated during construction phase is expected to comprise excavated material, construction and demolition (C&D) materials, asbestos wastes, chemical wastes and general refuse. 3.9 C&D wastes will be sorted on-site to inert and non-inert materials and shall be disposed of at public filling areas and landfills respectively. Strict management and control of all wastes generated on site during the works will be provided, and that material will be collected, handled, stored, transported and disposed of in an appropriate manner. Adverse environmental impacts are not anticipated. Environmental impacts arising from the transportation of waste such as noise, vehicle emissions will be low, as the amount of waste quantity is small. 3.10 Town gas will be used as fuel and all cremations will be carried out in enclosed cremators, land contamination impact associated with the operation of cremators is not expected. 3.11 Small volume of diesel fuel will be stored for the emergency generator. Precautionary measures will be taken to mitigate the impact due to accidental spillage and rupture of storage tank. With the implementation of precautionary measures, land contamination impact is not expected. 3.12 Some landscape areas, including the existing garden, will be reprovisioned from this Project. Mitigation measures including compensatory planting have been proposed for the garden. The landscape and visual impacts of the Project are considered surmountable. 3.13 Minor visual impacts of the Project are expected on Lakeview Garden and hikers on the Reservoir Dam. The impacts would be mitigated by planting tall mature tree around the Crematorium to screen off the unsightly view. 3.14 The proposed flue gas filtering system involves only dry processes. There will be no effluent discharge from the new cremators nor the associated air pollution control system, so adverse water quality impact is not expected. 3.15 The proposed cremators will be fuelled by commercial town gas supplied by the local Town Gas company via direct pipelines and there will be no storage of town gas on site. Therefore no life hazard associated with fuel gas storage exists. 3.16 The scale of construction works for this Project is small, and adverse environmental impacts, including air quality, waste and water quality impacts on the surrounding sensitive receivers, are not expected. 3.17 During operation phase, chimney emissions including particulate matter, carbon monoxide, hydrogen chloride, mercury, organic compounds and dioxins would be emitted from the crematorium. With the compliance of BPM 12/2 emission limits, chimney emission from the cremator is low, and air quality at the ASRs will comply with the relevant limits and guidelines. Continuous monitoring of temperature, oxygen, carbon monoxide, particulate matter and smoke density will be conducted at each stack or inside each cremator, in accordance with the BPM 12/2 requirements. Emission of hydrogen chloride and dioxins will be monitored by routine monitoring in 6 months intervals. 4.1 Environmental impacts arising from the Project have been assessed. New cremators, complying with the latest environmental requirements, will be installed, and relevant environmental criteria and guideline will be satisfied. The amount of pollutant emissions will be reduced and the environment will be benefited, with the new cremators. An EM&A programme has been recommended to ensure that the relevant emission limits are satisfied.